Bus from Klang to Alor Setar is the most convenient form of transportation to travel between the two cities. The direct bus service from Klang to Alor Setar would save the passengers' time and money from getting to Kuala Lumpur TBS for taking bus or getting to KLIA or KLIA2 for taking flight. 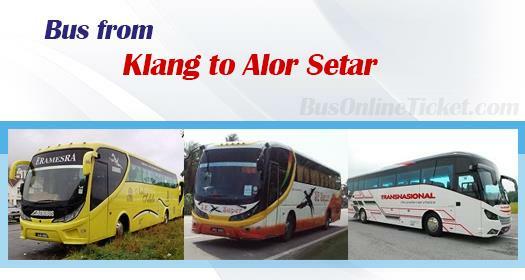 There are two types of operators operating bus from Klang to Alor Setar. First type is coach company running the service under own brand like SE Super and Transnasional. Second type is agency who charters other brand to provide the service. These agents include DSM Bersatu, D Amour and Billion Star. Their combined trips from Klang to Alor Setar have up to 16 daily departures. The earliest departure goes at morning 9:30am, while the latest departure is at night 11:30pm. The bus fare for bus from Klang to Alor Setar is selling in a range of RM 45.00 to RM 53.00, depending on your selection of bus operators. Transnasional is the only operator who offer child fare at RM 37.10. Duration required for bus from Klang to Alor Setar is about 6.5 hours. The travel time is depending on the traffic and weather conditions on the travelling day. Washroom break will be given during the journey. The boarding point for bus from Klang to Alor Setar is located at Terminal Klang Sentral. Passengers cab easily access to Terminal Klang Sentral via intercity bus or taxi because there is no nearby LRT station. The arrival point in Alor Setar from Klang is located at Alor Setar Bus Terminal. To travel from Klang to Alor Setar, you can always book your bus ticket from the most trusted and convenient online ticketing portal BusOnlineTicket.com. By booking with BusOnlineTicket.com, it provides instant booking confirmation to passengers. Therefore, passengers do not need to waste their precious time queuing at the counter just to buy a ticket.